Abstract: The study of animal venoms aims to identify mechanisms and dynamics of poisoning, and also the search for new drugs. Thus, it is important to study the molecules that make up these poisons. For both the constant use of methodologies purification is necessary. For the venom of these animals are composed of complex mixtures of low molecular weight components, biologically active peptides and proteins. With the poison of tarantula spiders there is considerable interest in relation to the low molecular weight components and proteins. These venoms contain a variety of amines, free amino acids, nucleosides and nucleotides as well as various ions (calcium, chloride, magnesium, potassium, sodium). Among the proteins, such as those having enzymatic activity, the most commonly found are the collagenase and hyaluronidase, two enzymes involved in the degradation of the extracellular matrix facilitate diffusion of the poison from the inoculation site. In general, there are numerous peptides present in venoms of spiders and can reach 60 or more in the same venom. Thus develop strategies for the purification processes is of great importance for ensuring the purity and yield of the molecules of interest. Purifying bioactive molecules in the venom of the spider tarantula Vitalius dubius using different methods of purification. To obtain the enzyme hyaluronidase, the venom of V. dubius was fractionated by molecular exclusion column 1.0 cm x 30 cm. The elution profile was determined by monitoring the absorbance of the fractions at 280nm. The fractions containing activity were pooled be applied to the bioaffinity chromatography using a column of Heparin-Sepharose bioaffinity (5 mL). The proteins bound to the column were eluted and the elution profile was monitored at 280 nm and fractions were tested for their enzymatic activity. To obtain the low molecular weight components of the venom was subjected to a filtration process used filter centrifugation, 4 mL, with porosity of 5000Da. With this process it was possible to separate the venom into two groups, LW (low molecular weight), and HW (high molecular weight). After this process the two groups of fractions were fractionated by a sequence of chromatographic purification part where the light from the venom (LW) was applied to a column semi-preparative cation exchange monitored at 214 and 280nm. Then the fractions containing antimicrobial activity were applied to a C18 reverse phase column monitored at 214 and 280nm. In the purification of heavy part of the venom (HW) was used primarily a reverse phase column (3ml) at 214 and 280nm monitored using a flow rate of 1mL/min. The antimicrobial activity containing fractions were applied to a C18 reversed phase column monitored to 225nm. The enzyme hyaluronidase from the venom of V. dubius was purified in two steps (molecular exclusion followed by affinity chromatography on Heparin-Sepharose). This purification was facilitated by the lack of high molecular weight proteins in the venom, and the fact that the enzyme was eluted in the wash since the affinity column in the second stage. Purification described here was similar to that reported for other venoms which the enzyme was purified in two chromatographic steps as in the case of the scorpion Buthus martensite and fish Synanceja horrida. The process of purification of the toxin VdTX-I, LW fraction from the venom in this purification process was done manually collecting the detected peaks. This collection method was used due to the proximity of the elution peak. The fraction containing antimicrobial activity was then set aside for the completion of the second phase chromatography. The heavy fraction from the venom of V. dubius (HW) previously separated, was initially applied to the reverse phase column RPC 3 ml, when there was the presence of several peaks, which were named G2 and G3. The G2 peak was separated into other applications, since the peak G3 as well as other microorganisms were tested against, and only the peak G3 showed activity against these microorganisms, this peak was then separated for the next purification step fraction G3 (which showed antimicrobial activity) was then subjected to a second chromatography step, using a C18 column, where they were identified two peaks P1 and P2. We conclude that different for the purification of molecules from the same venom, it is necessary to apply chromatographic methods that suit best the physicochemical characteristics of each molecule that is sought to purify. Such methodologies should be applied in a manner to always preserve the integrity of these molecules. Summary: Studies demonstrate that the venom of animals are composed of a complex mixture of small molecules, proteins and peptides. 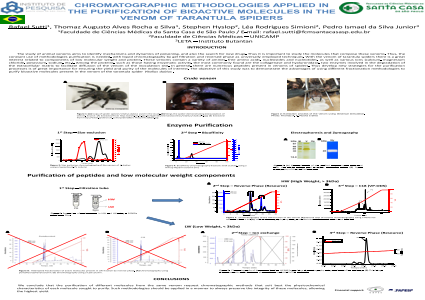 In the venom of the tarantula Vitalius dubius, there is a wide range of peaks can be observed in different methodologies chromatography. Such as reverse phase chromatography, size exclusion chromatography, and ion exchange and bioaffinity. This work demonstrates the use of different methods for the purification of different molecules.References: ROCHA E SILVA, T.A.A., SUTTI, R. & HYSLOP, S. (2009). Milking and partial characterization of venom from the Brazilian spider Vitalius dubius (Theraphosidae). Toxicon, 53: 153–161. ESCOUBAS, P. (2006). Molecular diversification in spider venoms: A web of combinatorial peptide libraries. Mol. Div., 10: 545-554.